Dahua PFL complex cone crusher is based on more than 20 years of accumulated experience, combined with domestic market demand, through independent research and development, developed an efficient, energy-saving crusher equipment. PFL complex cone crusher is widely used in metallurgy, sand aggregate, cement mining and other industries for fine crushing operations, which can be used for the crushing of limestone, dolomite, lime, sandstone, soft iron ore and other 160MPa dry non-stick materials. Is the first choice for soft materials crushing, like limestone. Over the years, a total of 1,500 cone crusher were sold and won a high reputation and praise. You may be wondering why this crusher is so popular? Here, we will introduce the PFL complex cone crusher. Large crushing ratio: the max. feeding size is 80 ~ 220mm, discharging size is ≤3mm, accounting for 90%. Wearing parts has long service life: high hardness, high toughness multi-alloy wear-resistant material, less wear. High efficiency and energy saving: it can increase the output of the mill machine by 40% and reduce the power consumption of the system by 30% when used with the mill. Smooth operation, low noise, small vibration, good sealing. Easy to operate, small footprint, easy to install and maintain. PFL complex cone crusher is mainly composed of chassis part, rotor part, cylinder part, machine cover part, transmission part, adjustment part, and hopper. Through the crushing chamber, there is no partition or grate in the middle, feeding smoothly. The crushing process is through crushing, the material pass through quantity is big with fast speed, therefore the output is high. The distance between hammer head and counterattack plate can be adjusted to ensure that the utilization rate of hammer head with uniform particle size can be greatly improved. The optimal design of the rotor part forms the multi-stage continuous crushing cavity, and the energy and space are fully utilized to improve the performance of the machine. 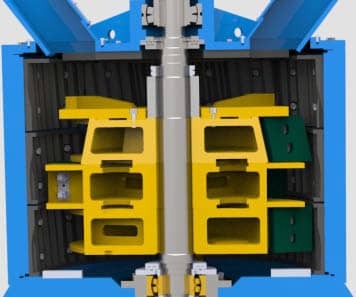 When the crusher works, the rotor fixed on the spindle rotates at a high speed in a certain direction under the motor drive, the block material falls from the hopper to the rejection plate, after the impact of the high-speed rotating rejection plate, under the action of centrifugal force, is quickly thrown to the impact plate and produces impact. Under the action of gravity, along the inclined plate, materials are rebounded to conical rotor crushing cavity. After receiving the impacting force from upper hammer head, the materials are thrown to the impact plate by accumulating enough energy, and then repeat the above progress. Finally, the materials are broken into the required particle size and discharged out. The reason for such a great success depends on our market survey, research and development, innovation, and customer service. Luoyang Dahua takes the customer's demand as our own responsibility, always controls the quality, strives for perfection to the detail, adheres to the management idea of "the quality creates the value, the good faith casts the future" . In 2018, the company was again awarded as an Excellent Enterprise in China sand and stone aggregate industry. The company produces all kinds of rock crusher, sand crusher, and stone crusher, which are widely used in water conservancy and hydropower, dam construction, railway and highway, mining cement and other fields. Welcome customers contact us: lydhchina@huazn.com.